These projects include the re-construction of approximatley 22,165 SF of exterior walls for a 4 story swimming pool atrium space;total renovation of toilet rooms for 66 rooms, 2 public toilet rooms, corridor finishes, internal roof drains, an approximate 1,200 SF addition, the remodel of 60 guest rooms, corridors, remodel of compliance office areas, HVAC and electrical upgrades. 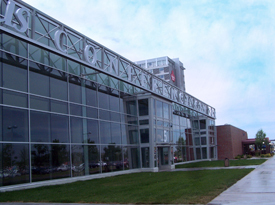 Items of work included complete demolition of exterior walls, new curtain wall system, new interior finishes, architectural metal wall panels, outdoor patio addition and site work. 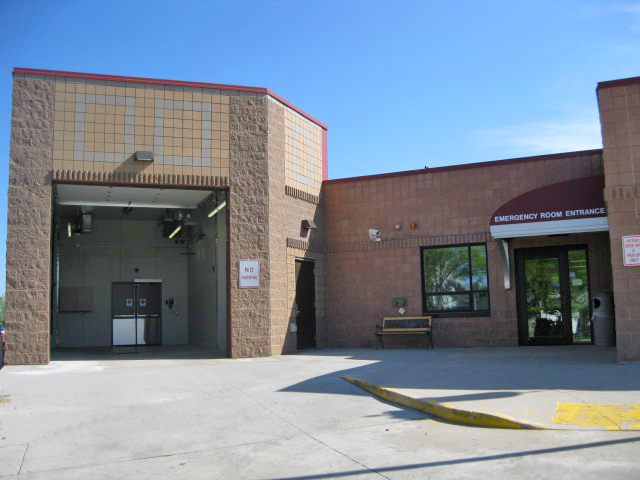 Other projects have included the RV Park 20 Site Expansion which included Class IV base, geotextile fabric, concrete slabs, and all sanitary sewer installation and connections. 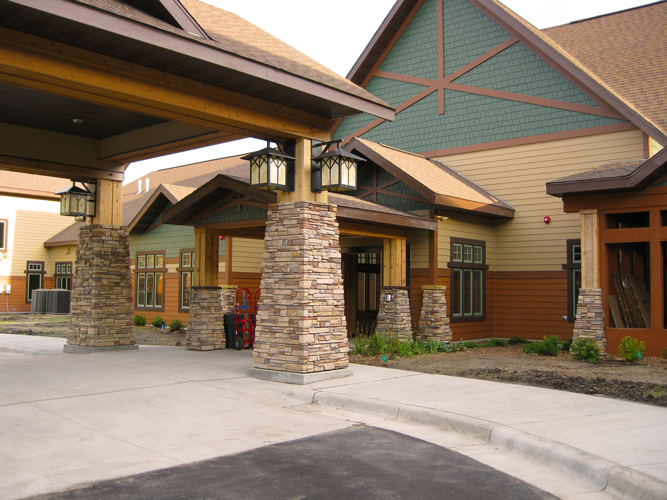 The Tufte Manor Link project consists of an approximately 26,500 GSF, 2 story, wood framed building with a single story connecting link to Tufte Manor. We were able to assist in the cost analyzing and design during the feasibility phase which helped maintain the construction budget. 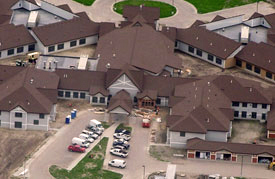 Other projects for the owner consist of a 25,000 SF, 32 room addition and extensive remodeling of an existing facility complete with nurses stations, resident rooms, dining facilities, kitchen facilities, conference rooms, family areas, coffee shop, recreational areas, housekeeping areas, medication rooms, classrooms, new front entrance and bathrooms. All aspects of these project conformed to the engineers specifications and fulfilled the requirements of the special needs residents. Upon starting these projects we knew how important it was to keep the facility up and running as many of the patients were in need of daily treatments. 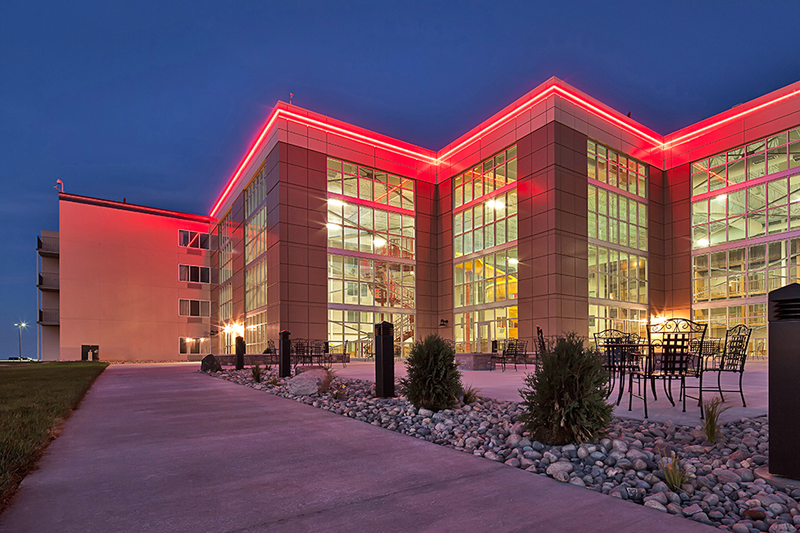 With a project team consisting of the owner, architects, contractor and local subcontractors we were able to accomplish that through phasing of the project and communications with all members of the project team. The projects went very well with minimal interruption of the facilities normal day to day activities. Additional projects have included a courtyard remodel, monument signage, lounge remodels as well as other miscellaneous projects. 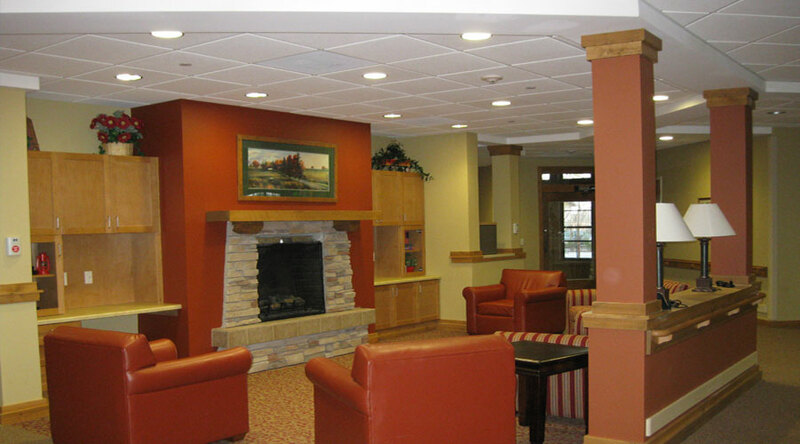 This project consisted of a new 133,000 square foot facility that includes a 49-bed nursing care unit; 22 general assisted living units; 10 memory loss and cognitive impairment assisted living units; and 22 congregate independent living units. 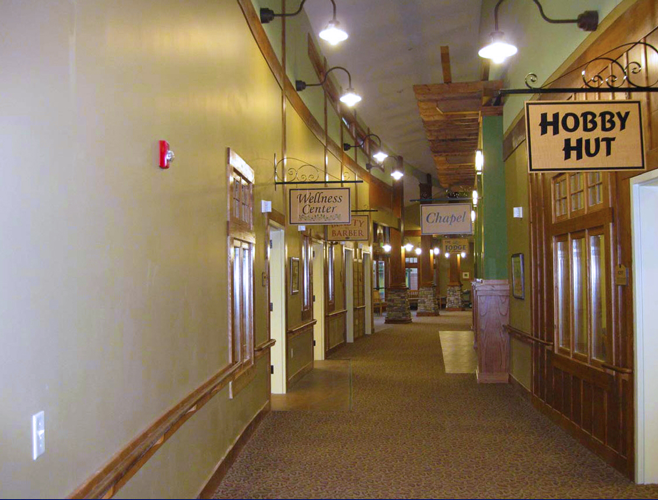 The campus is organized around a Town Center which includes group activity areas, a media and education center, a chapel, beauty and barber shop, therapy room, a club room, wellness center, and a small general store/café. 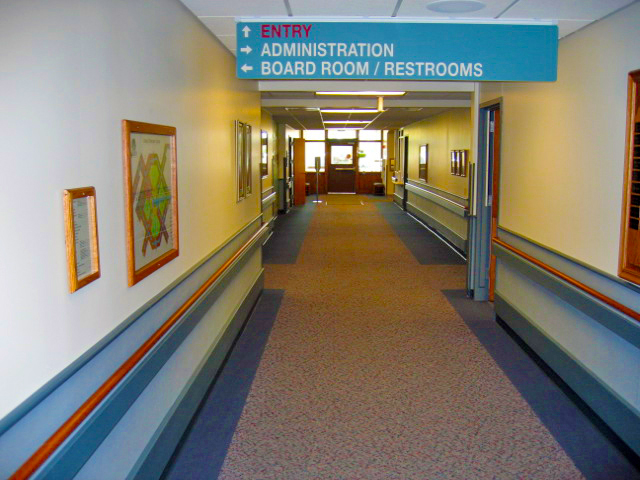 Specific items include state of the art security measures to ensure the care of safety of residents including personal wander guards, security gates, and secure zones which are operable from the central nursing station. 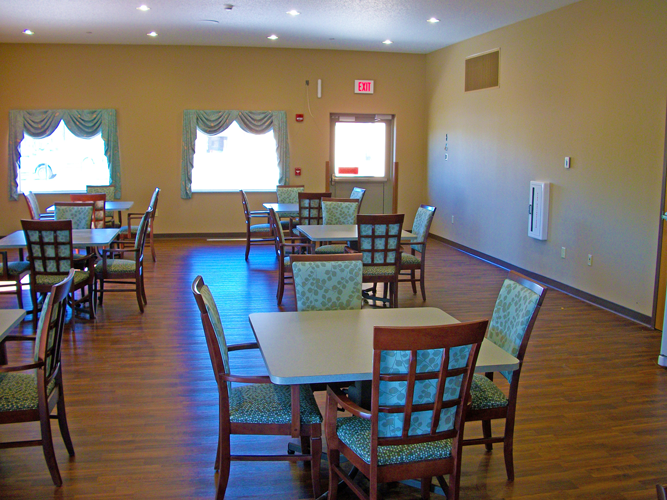 The new layout presents the Warroad Care Center with the opportunity to enrich the lives of residents and families with surroundings and program options not available anywhere else in northwestern Minnesota. Additional work ICS was able to fit in the budget includes a water feature, signage, lighting, and additional landscaping items. 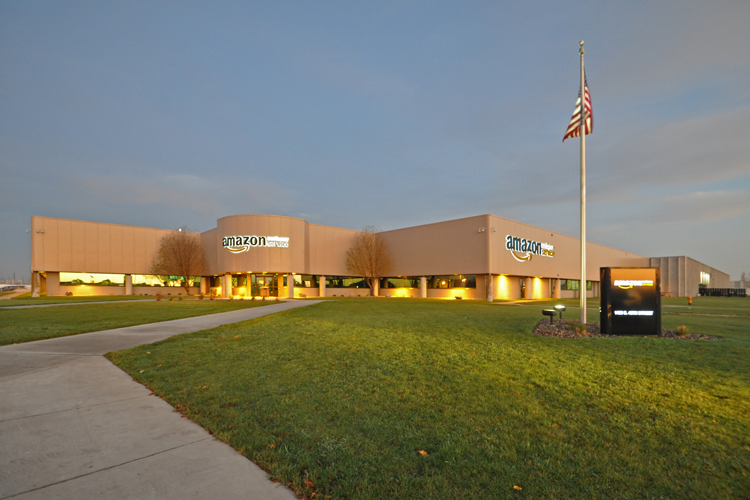 ICS has completed multiple phase remodels of the 50,000 SF existing building. 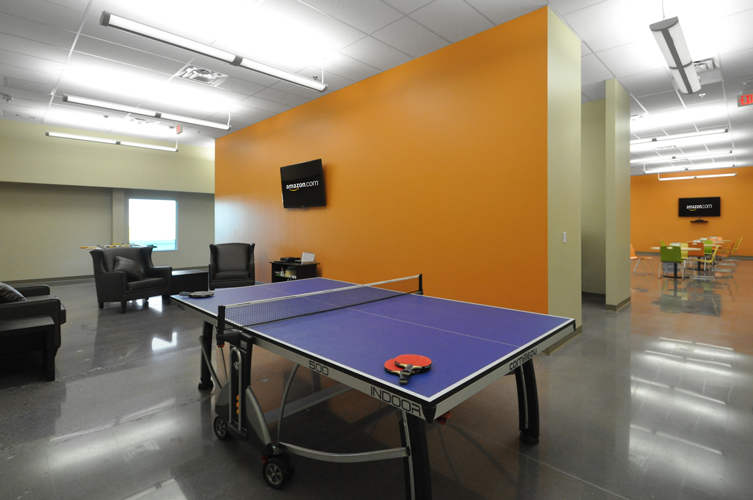 Work included new office spaces, multiple conference rooms, classrooms, food service and dining area, quiet rooms, mothers room, recreational/gaming space, IT area, reception area, common areas, turnstile doors, bathrooms, ceilings, various types of flooring, polished concrete, painting, & millwork. 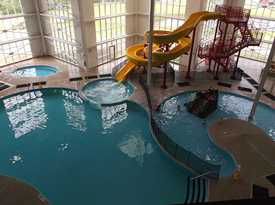 We were responsible for the coordination of all work including mechanical, electrical, and various tenant contracted vendors. We were able to finish the original scope of work plus some additional items the owner and tenant wanted within the budgets and scheduled deadlines. 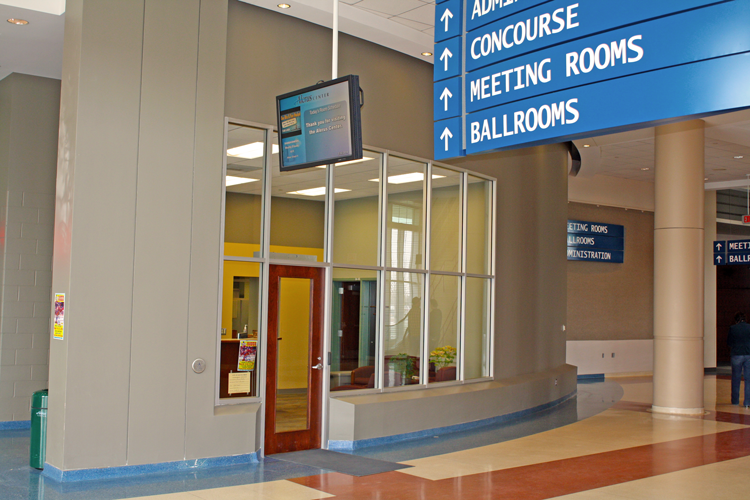 The Conference Center Addition and Suite Level Window project consisted of a new approximately 3,700 square foot glazed conference center lobby added to the east side of the Alerus Center arena. 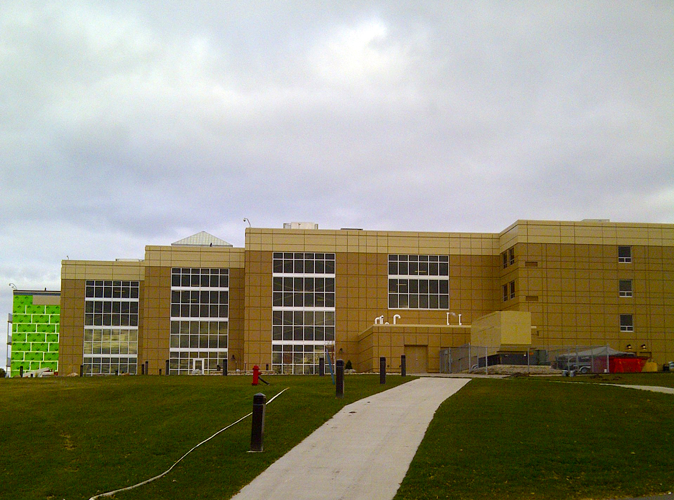 Major items of work included demolition of existing exterior wall, new all glass walls and vestibules; tie-ins to existing building systems as well as exterior signage. 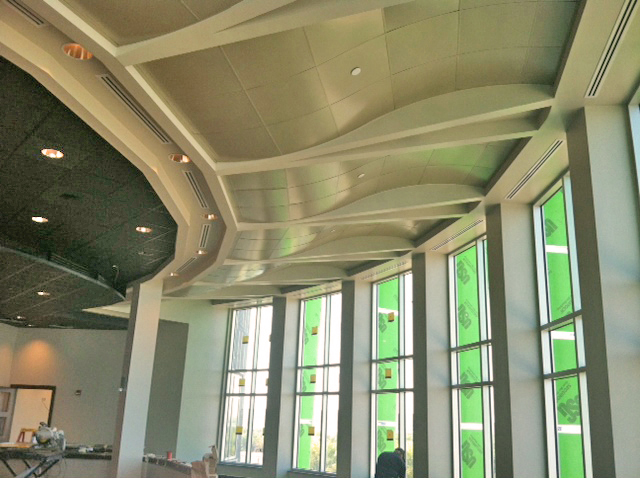 A new section of windows along the east corridor of the suite level of the building are also included in this contract. 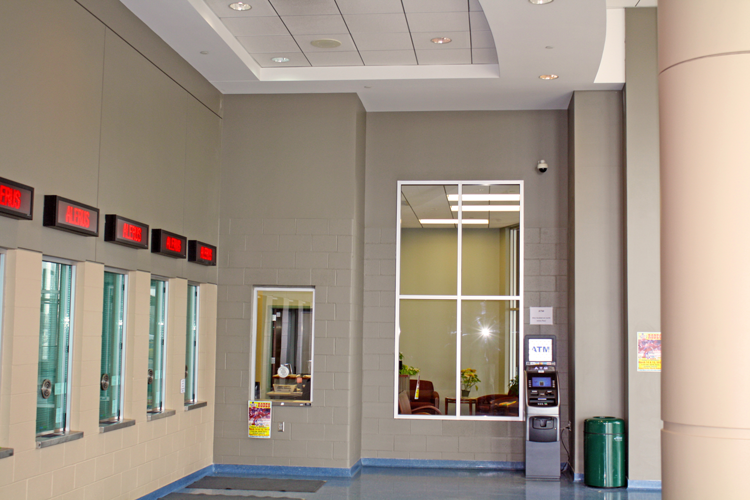 Other projects included the Club Renovations and Radio Room, Escalator Addition, as well as other miscellaneous remodel projects. The Synthetic Turf Conversion System project occurred within the existing Alerus Center Facility and consisted of the removal and replacement of the existing synthetic turf, the existing roll-up machinery and the existing concrete pit removal and reinstallation of the steel framed pit lid, improvements to the electrical power that services the roll-up machinery within the pit, and polished concrete finishing. Shoring and excavation support adjacent to a pair of pile groups and piles caps was also required. There was limited use of the site for staging and storing as the owner maintained their operations during the project which was located within the main seating bowl and large event area. The new conversion system enables the Alerus center staff to install or remove the complete field within 2 hours, utilizing 6 people or less on a weekly basis during peak seasons. The Foundation Project consisted of the installation of all concrete foundations for the orginal 272,232 square foot sporting events and convention center. Excavated and Backfilled 25,000 cubic yards for pile caps; spread footings and foundation walls. Installed 168 each – Reinforced concrete pile caps, 5'x5'x4' to 9'x5'x4' in size. Installed 118 each – Reinforced concrete spread footings, 4'x4'x1' to 13'x13'x2' in size. Installed approximately 3,900 feet of reinforced concrete grade beam, 12"x48" to 48"x48" in size. Installed approximately 1,600 feet of reinforced concrete foundation wall.Total reinforcement for project was approximately 260 tons (516,000 pounds). Total concrete for project was approximately 3,200 cubic yards. Project finished in approximately 11 weeks. 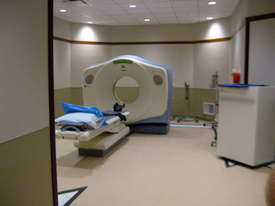 The CT Scanner Addition & ER Remodel project consisted of a 2,013 SF addition and remodel of the existing approximately 50,000 SF facility. items of work include sitework, shoring and bracing, cast-in-place concrete, masonry, structural steel, finish carpentry, firestopping, roofing, sectional overhead doors, aluminum entrances and windows, all finish work and landscaping. 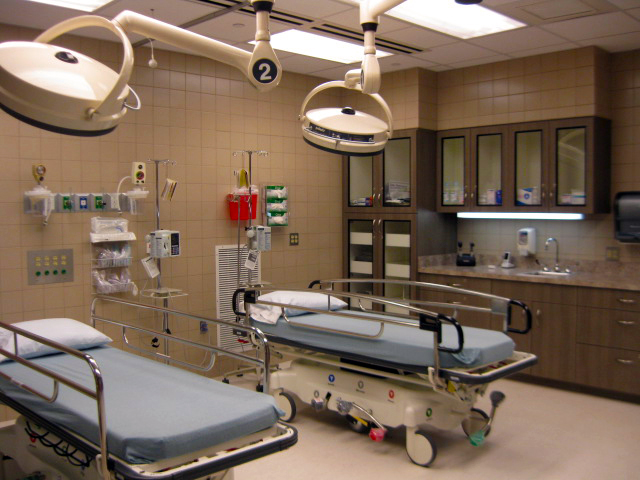 The addition includes a heated ambulance bay, a secure nurse's station, additional treatment rooms, and space for the CT Scanner. 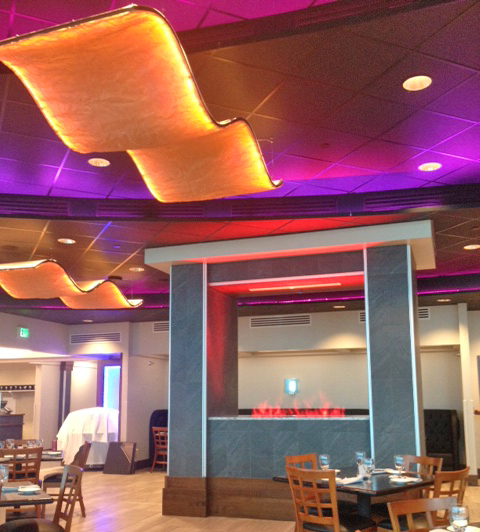 This project completed in August of 2014. 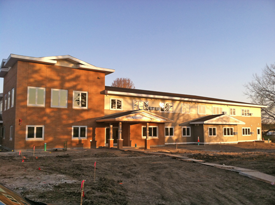 The Clinic Addition project consisted of a 6,151 SF addition and remodel of approximately 3,700 SF exisiting lobby and corridor areas. The new construction provides more space in the waiting room and appropriate settings for consulting with patients. A new parking lot was included in the project. ICS, Inc.© 2015. All Rights Reserved.